(MP286). Oscar Parkes OBE MB Ch B (1885-1958). Watercolour on board signed and dated 1914 (LR); annotated The Turning Trial HMS CENTURION (LL). This largish, striking watercolour of the new dreadnought battleship HMS CENTURION (Captain The Hon Horace Hood MVO RN) running trials just before the Great War has surfaced exactly 100 years after it was painted by the celebrated Dr Oscar Parkes, former editor of Jane's Fighting Ships. It is in quite excellent condition, appears to be unfaded and is spotless with no foxing. Trials for new warships have always been a lengthy business, especially for the first of class (HMS KING GEORGE V in this case), but all of the class had to be run through their paces to ensure the Admiralty was getting what it wanted - and had paid for - from the builders! Turning trials (the caption of this painting) would involve putting the wheel over at varying speeds and with varying degrees of helm applied to check that the hydraulic rams and associated steering motors and pumps were up to the job and that all the necessary alignments were correct and working. Also necessary was measuring the time the ship took to turn and the distance she would travel forwards through the water to complete that turn ("advance"), by how much she skidded sideways whilst doing that turn ("transfer"), and by how many knots the turn had reduced her speed by the time the ship had come out of the turn. Once completed at representative speeds and rudder angles, tables would be produced which would enable those who subsequently needed to manoeuvre the ship to pre-calculate how she would react, very necessary when, for example, you were manoeuvring in company with other ships or entering or leaving harbour with only limited water available under the ship and in which she had to stay whilst turning in the channel if she wasn't to run aground by advancing or transferring more than had been allowed for. Captain The Hon Horace Hood (the " 'On 'Orace" as the lower deck had it) commanded CENTURION during her early trials and commissioning on 1st May 1913, and remained her captain for a further 3 months until August 1913. Captain Hood was from a long and very distinguished line of illustrious naval seafarers, his ancestors various having been in the Royal Navy for generations. Possibly the most notable of the family was Viscount Samuel Hood who distinguished himself prominently in actions against the French in the West Indies at the close of the eighteenth century: and he had thereby fought together with Nelson in some tight corners too. In August 1913 Horace Hood, third son of the fourth Viscount, handed CENTURION over to Captain Michael Culme-Seymour, also from a well known naval dynasty. Less than three years later Hood, by now a Rear Admiral, was to lose his life under the eyes of his Commander-in-Chief when commanding the 3rd Battle Cruiser Squadron with his flag in HMS INVINCIBLE at Jutland. In recognition of this family's long and incomparable service to the Royal Navy, Horace Hood's widow launched the battlecruiser bearing the family name on 22nd August 1918. HMS CENTURION, one of the four King George V Class - AJAX, AUDACIOUS and KING GEORGE V being the other three - had been built by HM Dockyard Devonport and was just 3 feet short of 600 feet long overall. The class mounted ten 13.5 inch/45 calibre guns as main armamant and carried sixteen 4 inch guns too. They were considered well armoured battleships and had a useful 22 knots under their belt, a good speed in those days. HMS AUDACIOUS was an early war loss only some 10 weeks after its outbreak, being mined north of Malin Head off the northerly tip of Ireland at the end of October 1914. She managed to limp south towards Lough Swilly whilst valiant attempts were made to save her. But it was a losing battle and eventually she had to be abandoned, blowing up some hours later from what appears to have been an internal magazine explosion. 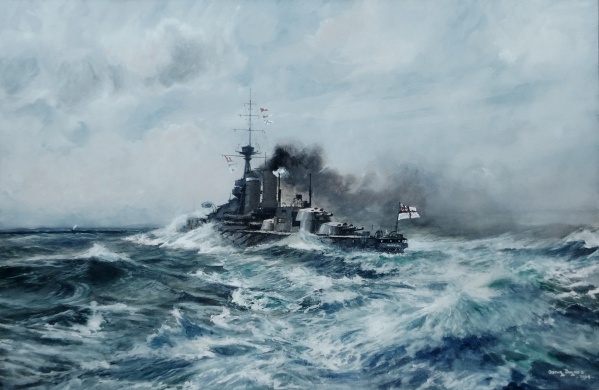 HMS CENTURION of the painting had a busy war with a vast amount of seatime as was the lot of the Grand Fleet: she was present at Jutland (2nd Battle Squadron) under Culme-Seymour who was then relieved by Captain Roger Keyes, another notable from the Navy List of that era. CENTURION deployed to the Mediterranean from 1919-1924 when she was heavily involved in Black Sea operations and then was converted into a radio controlled target ship. The Second World war saw her performing useful service again, this time as the modern battleship HMS ANSON's double in the Indian Ocean, duty as an anti-aircraft battery at the southern end of the Suez Canal and finally, she was sacrificed as a breakwater and jetty off the Normandy coast for the invasion of 6 June 1944, being scuttled there on 9th June, her final duty done. A long and very varied career! Oscar Parkes OBE MB ChB was a doctor in general practice, qualifying in 1914. He joined the Royal Navy and after some sea time was appointed to the Naval Intelligence Division at the Admiralty. In 1919 he became official naval artist and director of the naval photographic section at the Imperial War Museum and although he left the Service in 1920 he had already been appointed editor of Jane's Fighting Ships, the annual publication founded in 1897: he was to occupy this post with distinct success for some 17 years. But he was still painting and his works are much admired and collected these days though there are far too few of them! He features in the collections of both the National Maritime Museum Grenwich and the Imperial War Museum. All the while he remained involved in medical practice and was for a while on the staff of Fordingbridge hospital in Hampshire. In 1958 he retired and went to live in Northern Ireland where he died aged 72 that same year. Painting, his garden and the Royal Navy were his abiding passions.